Cecil Sharp visited Henry Thomas on 3 April 1907 when Henry sang him the song ‘Come all you True Good Christians’. Sharp also collected the following songs from Henry Thomas: Adieu My Lovely Nancy, The Brickster, The Broken Token, The False Bride, The Husbandman and Serving Man, New Garden Fields, The Rose in June, The Seeds of Love, The Shepherd and His Fife, The Virgin Unspotted and The Sprig of Thyme. 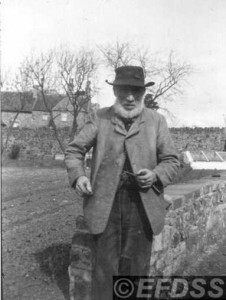 Henry Thomas was born approximately 1831 and died in 1915 aged 93 in Chipping Sodbury.